Someday Kira Bacher hopes to become either a lawyer or a judge. “I think I’d like being a judge and helping people. There are people who get wrongly accused and they need someone to help them,” she said. 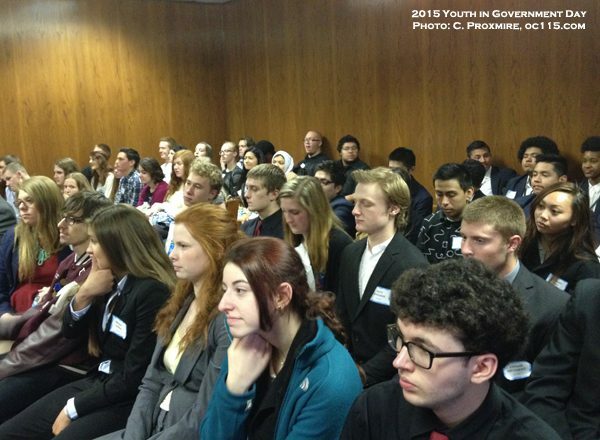 Bacher, who is a junior at Ferndale High School, was among dozens of students who came to the 35th anniversary of Youth in Government Day to learn more about how Oakland County works. 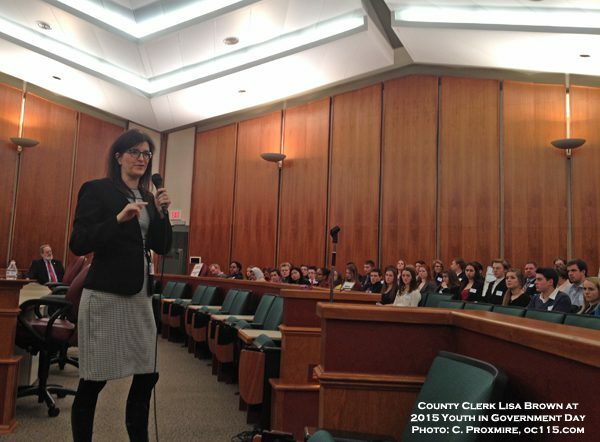 The program introduced students to County Commissioners, other elected officials, the Deputy County Executive and judges. Plus they got an up close look at Road Commission vehicles and had an engaging Q&A session with person whose job it is to oversee road maintenance and construction. For Krystal Rivas, also of Ferndale High, seeing it made an impact. After watching the General Governance Committee hold their meeting, Rivas said “I didn’t think of how much of a voice we have until I saw the woman get up and speak about vaccinations. 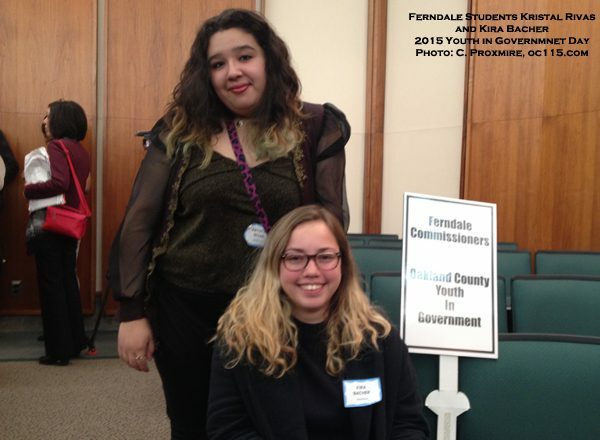 I think the passion she had helped, and seeing the commissioners taking in her voice was powerful.” Rivas hopes to go into the medial field, and possibly be an anesthesiologist. But she also feels drawn to knowing the law and the court system. “You need to know how to conduct yourself in court, and how to protect yourself. 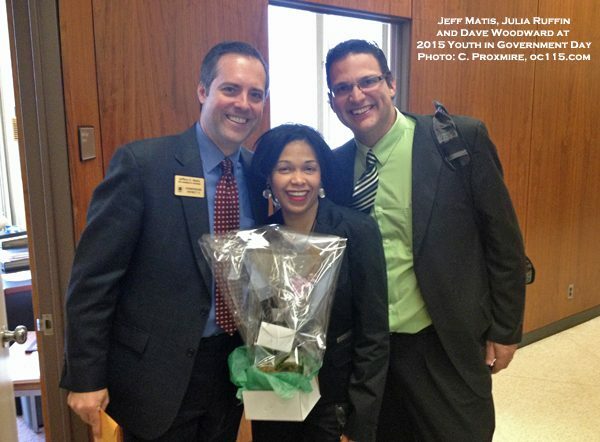 You have to know the do’s and don’ts of the law,” she said. 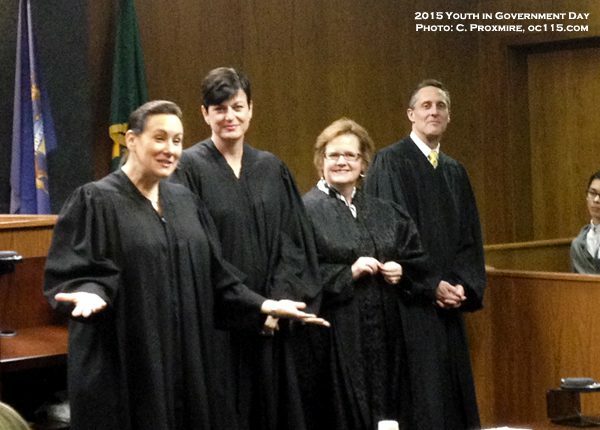 Seven judges from the Circuit Court took time to meet with the students. Hon. Judges Nanci J. Grant, Lisa Gorcyca, Daniel P. O’Brien, Lisa Langton, Michael Warren, Leo Bowman and Mary Ellen Brennan shared stories and advice about their jobs. Among a myriad of stories – some funny, some tragic, the students really wanted to know what the job was like for them. How could they send people to jail? How could they handle hearing about assault and murder? How do they keep their emotions at bay? 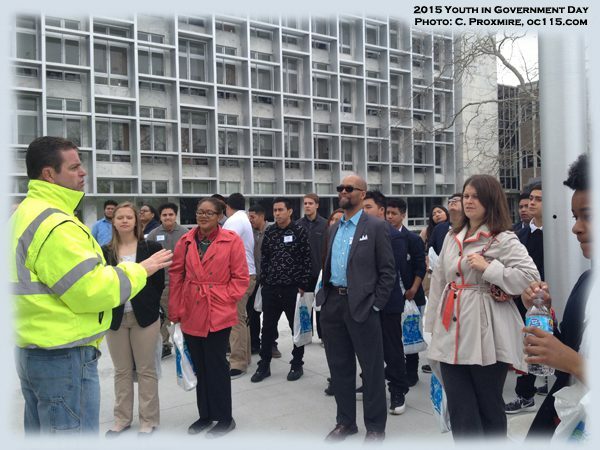 The other department that gave the students an up close and personal look was the Road Commission. 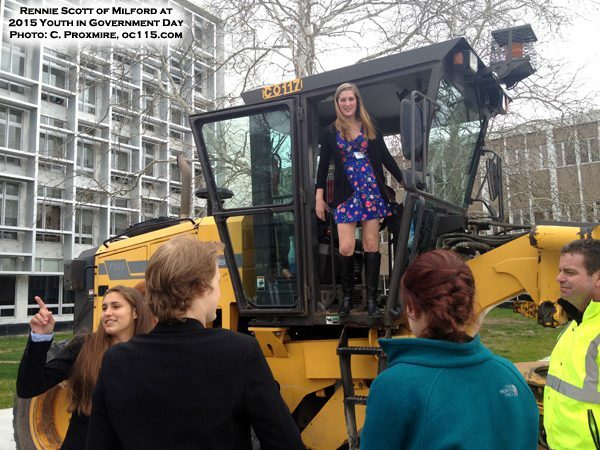 Students climbed aboard and explored massive gravel grating and snow removal vehicles. They also heard from Road Commission Public Information Officer Chris Bryson and Road Commissioner Greg Jamian. The Road Commission oversees 5,600 miles of roads (230 are state highways, 2,700 are county roads, and 2,700 are local streets). With a staff of 378 employees and $100 million budget, the Commission has the gigantic task of keeping roads maintained and plowed, as well as managing new construction projects. It’s not just nitty gritty work though. The Road Commission was happy to show off innovation and technology to the students. They are currently working with Detroit area automakers on piloting “connected vehicles” where cars interact with streetlights and other cars. Currently this helps time the stoplights, but eventually this technology can make self-driven cars a reality. Sensors also currently help track where Road Commission vehicles are, how much salt or brine they use, whether the truck has a plow up or down and tracks the progress of the vehicles for snow plowing. Oakland County has also become a leader in Michigan in the construction of roundabouts. “We love roundabouts because they improve traffic flow and reduce injury and death at intersections,” Jamian said. 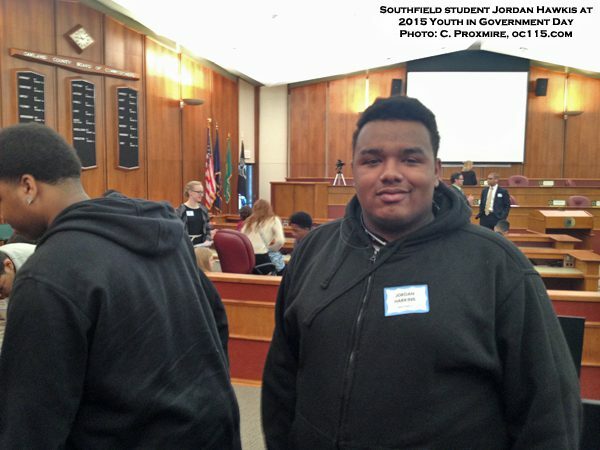 Derinda Shaw of the Greater Pontiac Coalition and Paulette Loe of White Lake Consolidated Schools were among the teachers and group leaders who chaperoned the students at Youth in Government Day. “We’re all about giving the students real world experiences. Most kids aren’t doing things like this, so this really sticks with them,” Shaw said. Loe said the experience is a great addition to classroom learning. “We teach a lot about government, but it’s almost all national government and not very much about local government. But this is what impacts their lives,” Loe said. Students came from Ferndale, Madison Heights, Milford, Oak Park, Pontiac, Rochester, Royal Oak, Southfield, Walled Lake and White Lake to take part in this year’s event. The Detroit Tigers and many of Oakland County’s departments such as Parks and Recreation, the Sheriff Department, the Water Resources Commission and the Planning and Economic Division provided promotional items for the event for the students. 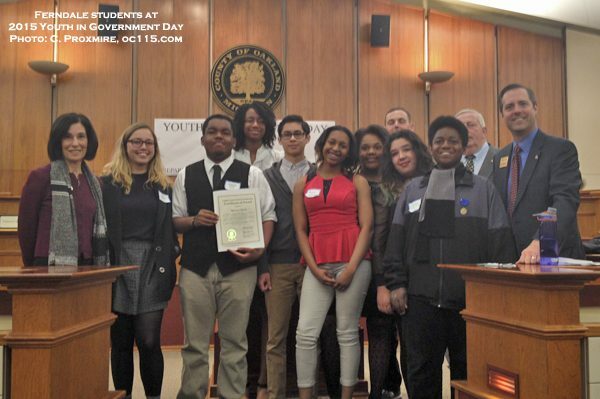 In the 1970s, Student Government Day was organized under the first Oakland County Executive, Daniel T. Murphy, and supported by the Oakland County Board of Commissioners to develop future leaders. 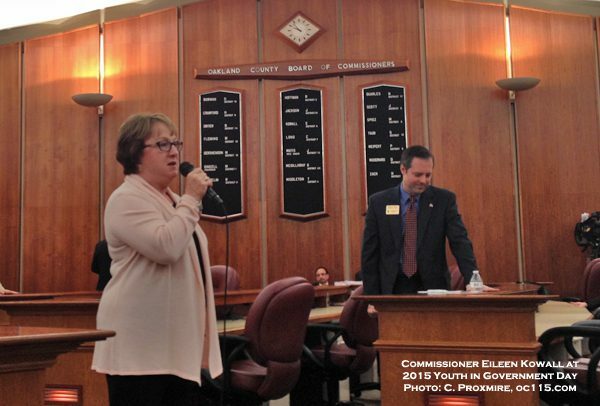 For the last 15 years, the Oakland County Board of Commissioners have been planning this program with the support of Oakland County Executive L. Brooks Patterson and all the Oakland County Elected Officials. 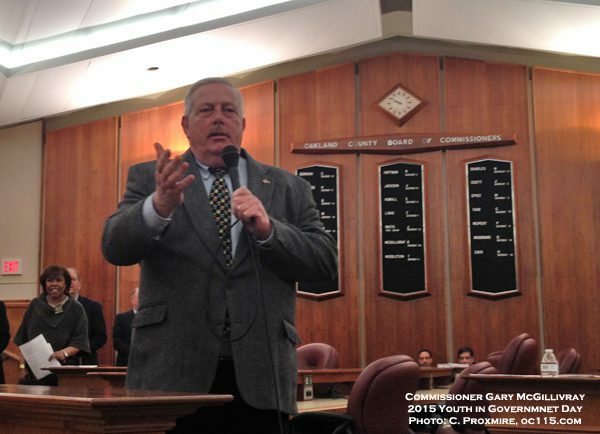 This program is held in April in observance of National County Government Month and was featured as a national model program in the National Association of Counties “County News” as one of three programs highlighted in 2014 and in 2013, the program received a special national recognition in 2013 from the National Association of Counties. 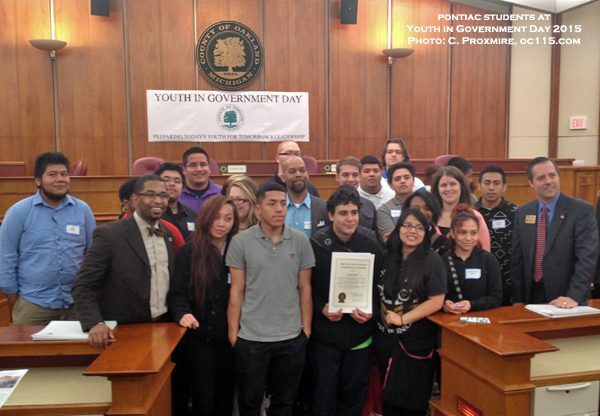 This year, Governor Rick Snyder sent a letter commemorating the 35th Anniversary of the Youth in Government Day Program and celebrating youth and the Commissioners efforts and all elected county officials for their ongoing involvement. Learn more about Oakland County at www.oakgov.com. 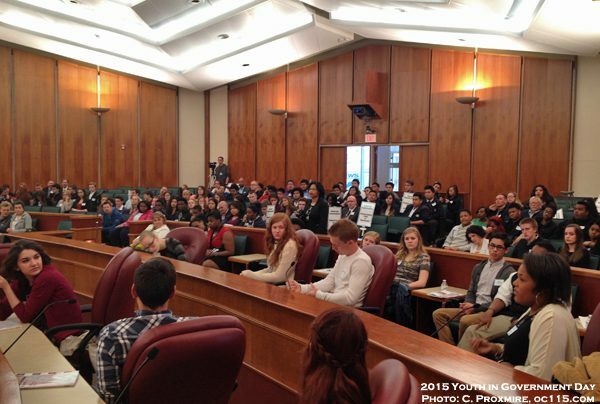 Note: This story has been updated to include some history of Youth in Government Day.